The Governor’s gallery in St. Mary’s Church. If the exterior and the yard of St Mary’s Church are not ­attractions enough, the interior is a treasure house of memorabilia. Any historian of the Raj can spend a lifetime just going over the gravestones, the memorial tablets and other artefacts in the church. It is also fascinating for the lay visitor, for setting foot inside is to be transported to another era. Time ­appears to have remained ­unchanged inside St Mary’s. Among the earliest descriptions of its interior is that of Thomas Salmon, an ensign with the Madras Garrison who wrote of it in 1699 after he had returned ‘Home’. Nearly a century later, when Edward, the second Lord Clive was Governor, he suffered as much during service, for his daughter Charlotte noted that it was extremely hot. Clive and family sat apart from the general congregation in the first floor gallery at the western end. ­Below this was the choir vestry thereby indicating that the gallery was originally built to house the organ. It is today much truncated but till the 19th century, the gallery extended fairly deep into the church. While the organ stood at the rear, the rest of the space was given over to seats for the Governor and Members of Council, and also the first family. In 1761, the two curved stairs on either side were built to provide access to the gallery from outside the church. This was from where the bewigged and powdered Governor accessed his pew. Though the gallery has since lost its length, it still retains its carved balustrade, a fine piece of teakwood that dates to the building of the church. Today, you will not find the organ in the gallery. 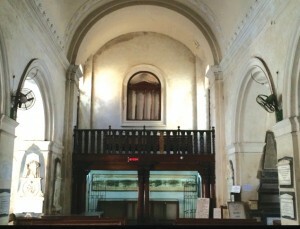 The present one is located at the eastern end of the church, to the left of the altar, a place earmarked for it since 1884. With its moving, the choir, on the rare occasion it performs, does so in front of the altar. The current organ is the fifth that the church has possessed. St Mary’s has the distinction of being the first church in Madras to install an organ, that being in 1687. The second one led a most adventurous life, having been taken away to Pondicherry by the French in 1746, only to be brought back in 1761. 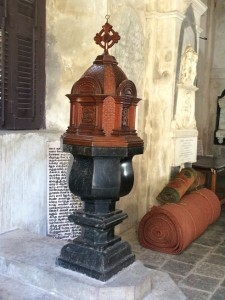 But a successor to it had already been procured in 1759 and so it (the second) was sent to St John’s Church in Calcutta! The third organ has the distinction of being an important part of the first ever concert of sacred music in Madras. This was held in 1794 with Michael Topping of the Madras Observatory playing it and Lady Oakely, wife of the Governor, being among the choristers. The fourth organ wandered all over Madras, or at least George Town, so to speak. When it made way for the fifth one in 1894 it was donated to the Holy Emmanuel Church in George Town. Later, when the organ at St Mark’s Church, George Town needed repairs, parts of the fourth organ were canni­balised for the purpose. The fifth (and present) organ at St Mary’s fell silent in the 1960s and would have been lost had not the Church of South India in 2004 commissioned Christopher Gray, an organ builder from the UK to restore it. This was completed within a year and pipes pealed again in a special recital by Dr Richard Marlow, Fellow and immediate past Master of the Trinity College of Music, Cambridge University. The ­organ is sadly not used any longer, probably because there are no trained musicians to handle it. The altarpiece is another historic survivor. A depiction of The Last Supper in the best Raphaelite tradition, it was for long assumed to have been part of the loot from the sack of Pondicherry in 1761. But art scholar Sir William Foster has since proved it to be the work of George Willison, who did portraits for Mohammad Ali Wallajah, the Nawab of Arcot in the 1780s. It is likely that this painting was also funded by the Nawab. The painting has been touched up by amateurs several times over and cries for a proper restoration at the hands of ­experts. Fronting the altar were once rails gifted by a Princess of Tanjore but these have long been replaced. The memorial plaque commemorating the original gift is still in place reading – “In memory of her friend Vere Henry, Lord Hobart, this railing is placed in the House of God by the Princess of Tanjore, AD 1877.” Hobart, Governor of Madras in the 1870s, died of cholera, an event that led to underground drains being installed in Madras for the first time. He is buried close to the rails but more on that on another day. To the right of the altar stands a lectern dating to 1933 but on it is a plaque commemorating an earlier one, gifted by Mary, Lady Hobart, in memory of her husband. In the southwest corner of the church, just before the exit to the walled garden, is another venerable relic – the baptismal font. It is made of Pallavaram gneiss, a form of granite that is also known as Charnockite, probably because the tomb of Job Charnock, the founder of Calcutta, and which stands in St John’s Church in that city, is made of the material. What is interesting however, is that three daughters of Charnock, all born to his Hindu wife whom he rescued just as she was going to commit sati on the pyre of her dead first husband, were bap­tised in this font in St Mary’s Church. The font cover, however, dates only to 1885. Just behind the font, in an alcove beneath the gallery, is a long display desk. This has under glass one of the church registers, open at the page that records the wedding of Robert Clive to Margaret Maskelyne in 1753. There are more records in the Fort Museum, including those with details of Elihu Yale’s wedding and the baptism of Charnock’s daughters. Just above this display desk is a photograph of a panoramic view of Fort St George. Dating probably to the late 19th or early 20th century, it is in a bad state of preservation. The church also has a magnificent collection of silver plates, all of which is now displayed in the Fort Museum. The oldest of these dates to 1687 and is an alms dish gifted by Elihu Yale. Having feasted our eyes on these, we will turn our attention to the tombstones, plaques and tablets on the floor and walls of the church next fortnight.